Two things came together for me this Christmas and what a hit. I got a cookbook called “The One Peaceful World Cookbook” and I got a box of Harry and David pears. This is my own recipe but their picture and idea, so give it a try. It fits the quick, easy, and delicious criteria!! This recipe is so easy and has so few ingredients I am almost embarrassed to share it, except that I use it so often with huge success! Peel and slice the number of pears you need for your number of people. I guessed at 1 pear per person and we could have had more. Simply place the sliced, peeled pears in sweet (not the unsweetened kind) apple juice and add a little cinnamon, a dash of nutmeg, and a little splash of red wine. 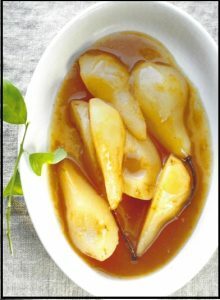 The pears should not be completely covered by the juice as you will toss them a couple of times in the cooking process. Bake the pears at 350 until pretty soft-to your taste. Toss a few times in the process to be sure all of the slices are kept moist. PS-This is NOT just for dessert!! This entry was posted in Recipes on January 10, 2018 by Judith.